One day, I caught my five-year old son looking intently at the “Family Rules” sign we have in our kitchen. You know the type of sign I’m talking about. 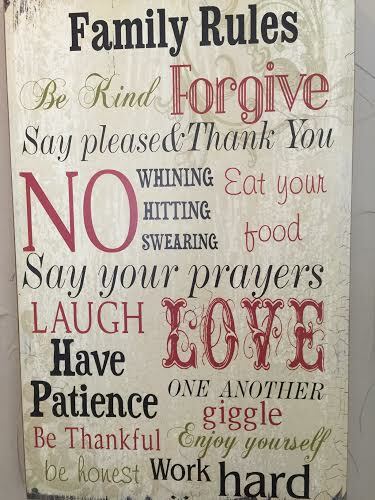 It says things like “Say Please,” “No Whining,” and “Giggle.” The fonts, capitalization and colors vary, and each phrase has a whimsical look and feel. The whole sign provides a visually appealing reminder of how best to act. It reminds me of the kind of behaviors I need to encourage in myself and my children. As I watched my son Will staring at the sign, I thought he was probably realizing what it said, as he had recently learned to read. He confirmed this a few minutes later by asking questions about what was written. “Umm, no,” I said. Now I was confused. Where was his little brain going with this? “The Family Rules are how we’re supposed to act when we’re anywhere, even when we’re at home,” I said. What happened next shocked me. My precious boy went from being proud of himself and in a great mood to sinking into a little ball on the floor in tears. His mood shift was so surprising and sudden, I thought he had somehow injured himself! I kept asking him if he was in pain until I slowly realized he really was just THAT upset about the sign. He was devastated that he was expected to follow all those rules, even when he was at home. I always suspected children saved their worst behavior for their parents because that’s where they felt safest. Now, I was sure of it! I crumpled to the floor right along with my son and wrapped my arms around him, reassuring him over and over again that he was loved, no matter what. That he didn’t have to be perfect. Finally, his heaving sobs subsided. Somewhere deep down within each of us, we all must know that we can’t quite measure up. My son sure knew this! He was crushed by it. He could only live with the inner knowledge of his humanness when reassured that he was loved unconditionally. Similarly, we can only live fully and freely when we acknowledge God’s unconditional love for us. That’s what this blog is all about – finding ways to become more conscious of God’s astounding love for us so that we can become who we are truly meant to be. You see, we need rules and laws and high expectations! Our “Family Rules” sign still hangs in the kitchen, even after Will’s meltdown. It still serves as a great set of guidelines for our family. It just needed to be put into perspective. Many of us start the year off with New Year’s Resolutions. New Year’s Resolutions can be a great way to improve yourself… as long as you keep things in perspective. You don’t have to be perfect. In fact, it’s not your job to be perfect – the glory of perfection only belongs to God. Jesus Christ was the only perfect human, and He died on the cross for you. Even though you will inevitably break the rules at some point. Even though you might not perfectly succeed at all your New Year’s Resolutions. In Him you still have a place to call home. A place where you can let your guard down and be yourself. Just as you are. Perfectly imperfect. Loving and accepting yourself, just as you are, can seem counter-productive to self-improvement. It’s necessary, after all, to push yourself in order to grow. You can’t just settle for the status quo. And the most typical New Year’s Resolutions, diet and exercise, revolve around healthy goals and choices. Instead of starting the year with the message “Don’t worry if you fail; you don’t have to be perfect,” shouldn’t we be encouraging each other with cheers of “You can do it! You’re worth it!”? The question of whether the acceptance of our imperfections lends itself to excuses and lethargy is at least as old as the Bible itself. The question is really this – if we face the reality that we are never going to measure up 100 percent of the time, why even try? Why even have rules or laws… or Family Rules signs… or New Year’s Resolutions? In the book of Romans, Paul tells us that “the law” is necessary not so that we might follow it perfectly, but rather, so that we have a clear understanding of right and wrong. When Paul refers to “the law,” he is talking about the myriad of rules laid out in the first five books of the Old Testament. For the people reading his words, these rules covered everything from loving your neighbor as yourself to The Ten Commandments to extremely specific dietary and physical requirements governing every aspect of their daily lives. Think of “the law” as our actual laws, our New Year’s Resolutions, our Family Rules signs, our basic codes of conduct and anything else you can think of that governs how you think or act. It’s kind of depressing how Paul puts it. The purpose of all our rules and laws and resolutions is not to provide a yardstick to which we might actually measure up. It is so that “we become conscious of our sin.” Yuck! Who wants to become conscious of his sin? Fortunately, we don’t have to dwell in negativity long. The very next set of verses changes the focus to something very positive indeed– Jesus Christ. Right here in this set of verses, Paul sums up the entire foundation of Christianity. We are justified by faith in Jesus. It’s important to have laws and guidelines, sure, but only to give us a mirror to see ourselves as we truly are – unworthy, imperfect, and in need of a savior. In the next couple chapters of Romans, Paul goes on to make incredibly detailed arguments to prove and further explain how we are justified by faith alone. Then, in Romans 6, he turns his attention directly to the question at hand. The truth is, we don’t have to choose between encouragement and love. Self-improvement and self-acceptance are not mutually exclusive. You can carry with you and share with others ALL of the affirmations below. It’s okay not to be perfect. You are loved no matter what. Jesus continues to describe several other things that are “blessed,” but these three lines give you a good enough idea. Blessed are the beautiful, for theirs is the kingdom of Instagram. Blessed are those who have cute children, for they will be liked on Facebook. Blessed are the funny, for they will inherit a large Twitter following. Imagine seeing #blessed used on social media differently. And yet, it is through some of the most difficult times in my life that I have come to know God the most. While it is often impossible to see it at the time, pain produces immense spiritual growth when we allow it to. Below are a few examples from my own life. I’m sure you can add many more. When I have been low in spirit, it has forced me to my knees where I have received God’s love in a richer, deeper way than I have otherwise known. It was at a funeral when I was overcome with the certainty that there is most definitely a heaven. This comfort I felt from God while mourning was most certainly a blessing even though the life of the loved one we were burying was seemingly lost much too soon. One moment of being gentle and humble, or meek, strengthens my personal relationship with my husband in ways that years of assertive and proud behavior could not. Instead of labeling things as good or bad, I’ve come to realize that time is better spent realizing how each moment is truly blessed. You see, when we reach and strive for God, it does not matter whether we are feeling “#blessed” or just plain old “blessed.” God is there in all of it. No matter what you are going through, today I challenge you to trust it to God. Even if you can’t see it right this second, He is there. His love is just waiting for you to seek it.